Every six months or so, I try and do a total clean-out of my kitchen. Well, let me be honest here, I dont do it alone – my beloved Hildabilda and AngelKitten are on hand to help — and also to take home the doubles and sometimes triples of things I find hiding out in dark places! Without these two, I doubt I would have the energy to tackle my kitchen. Though it is tiny… I can almost touch the four edges if I stand in the centre… it is packed from floor to ceiling with stuff. And sometimes, stuff gets so crowded upon each other that I cant see or find the thing I desperately need – so instead of taking a breath, and finding it, I go out and get a new one! This drives me crazy. As does the spice-herbs-oils-vinegar collection that sits around and gets sticky and confused and …lets say, unfresh. So… once every six months, I do a total clean-out. 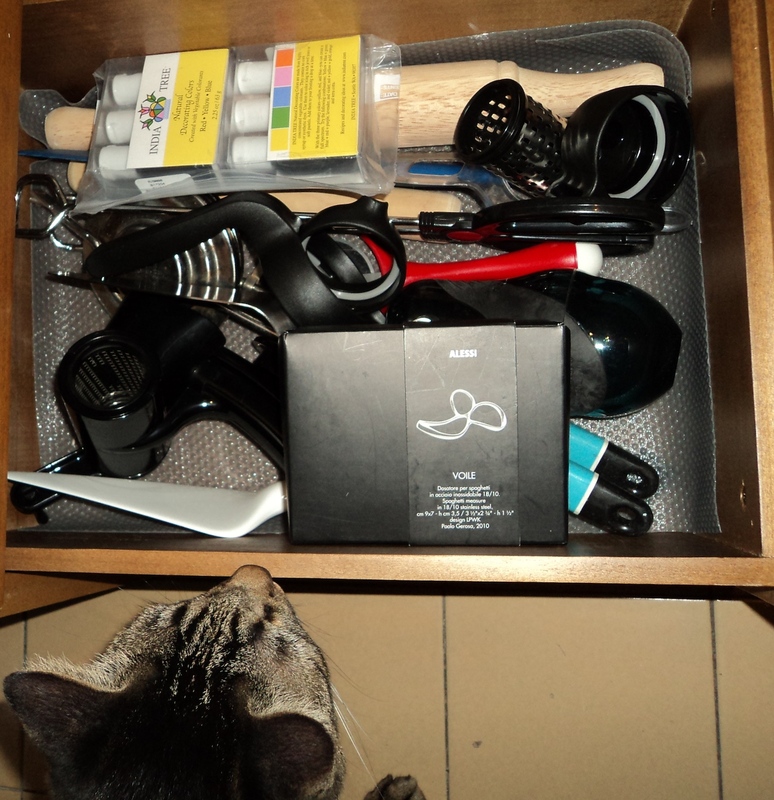 I inspect every drawer, take everything out, and put most everything back again. I assess if I really want something or not. My philosophy is that if I have not used it or thought of it or seen it in six months, well then, its not a part of my life. Its out! And those things I do want, need or use, sometimes need a little wipe down, spices need to be checked for freshness (after 6 months, they usually get tossed), and oils need to be checked for ripeness. Anything I can recycle, I do – to other people, or to the recycling centre at Ikano. My spices and herbs shelf. Finally organised so savoury spices and herbs are on the left, and those flavourings usually used in baking sweet things on the right. This shelf was so full that I could never find anything. I think I had 3 tins of baking powder, 3 jars of rosemary, 5 different kinds of salt. Now I can reach what I need easily, and I can tell that actually, Im running out of cinnamon! 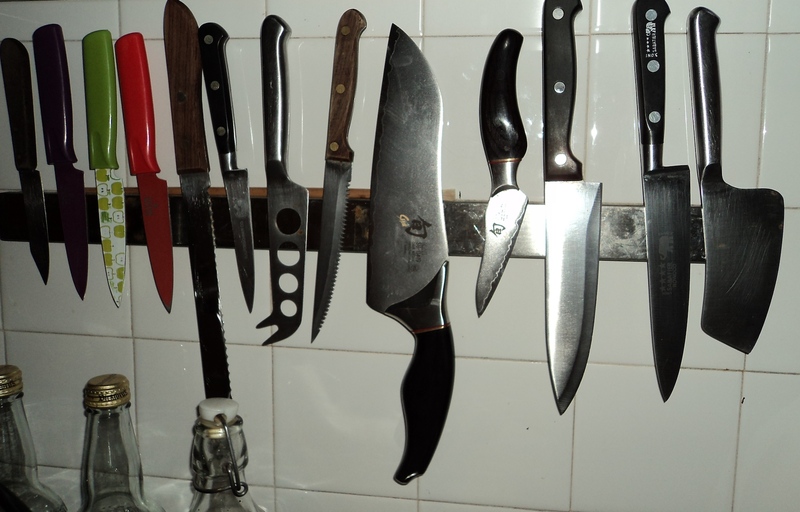 My much used knife rack. Note the addition of my Shun Elite Santoku and paring knives. Oh how I love love love them! I sharpened and cleaned the knives as part of the general clean up today. They are all happy and purring as a result. 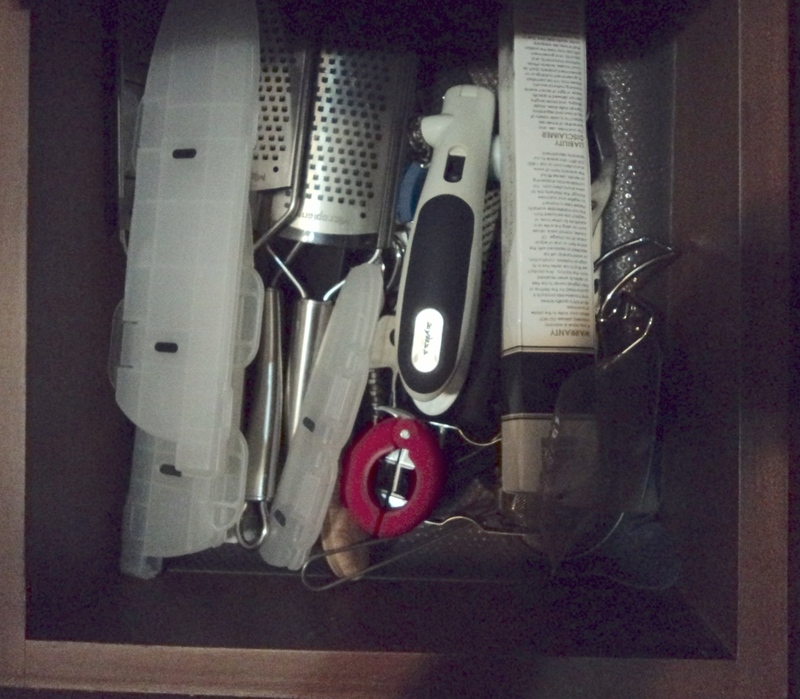 My graters, sharpeners and knife guards all in one place! The knife guards and Shun sharpener are from the US. The Microplane graters I could not live without. And Im always scrabbling to find them. Now they all live in one place, together. 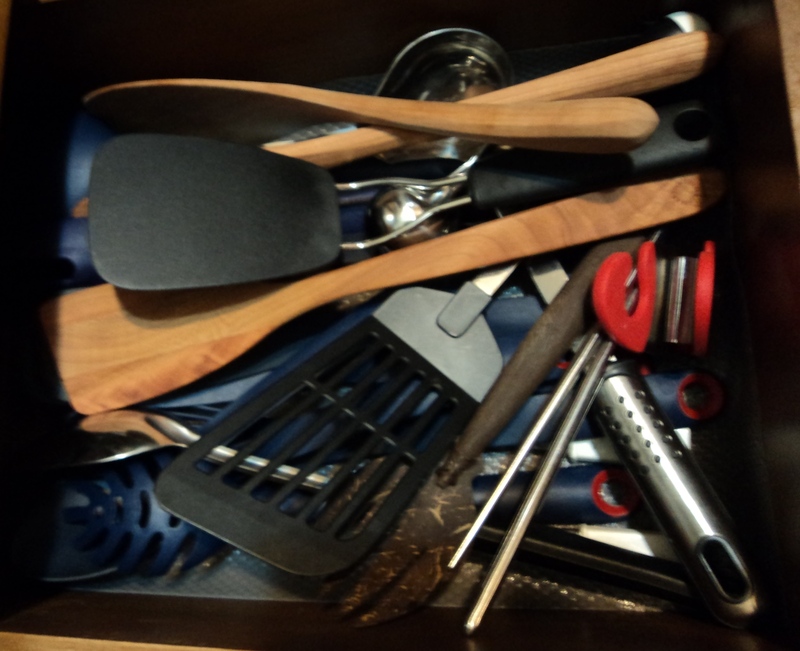 My baking cupboard – finally with everything in its place. 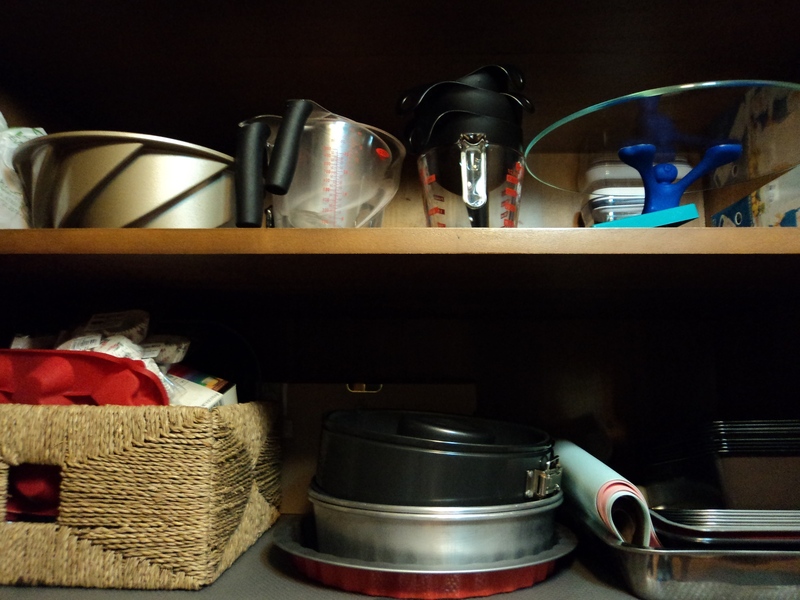 My beloved Alessi cake stand, my measuring jugs, fantastical bundt pan, and all shapes and sizes of baking pans – from cake tins, loaf tins, spring form pans and pie tins. On the bottom shelf, on the left, is my cookie cutter box – all the different cookie cutters I have collected for years, all in one place! Hooray! 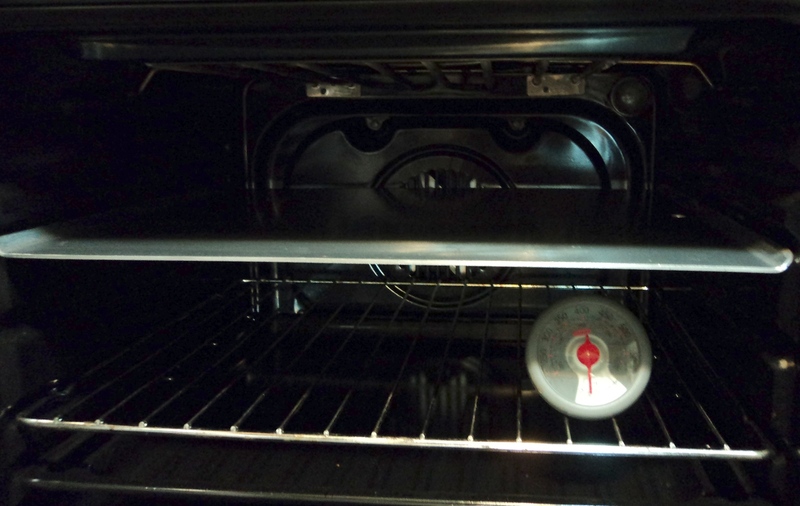 The inside of my oven – with my new Oxo oven thermometer which has changed the way I bake – I now know exactly what temperature my oven is running at (its usually too hot) and I can adjust! And my new cookie sheets – they were dwarfed in my sister’s large oven, but they actually act as cookie racks in my little oven. No matter, they make perfect cookies, no burning, no twisting of the pan, smooth even heat. Such joy. 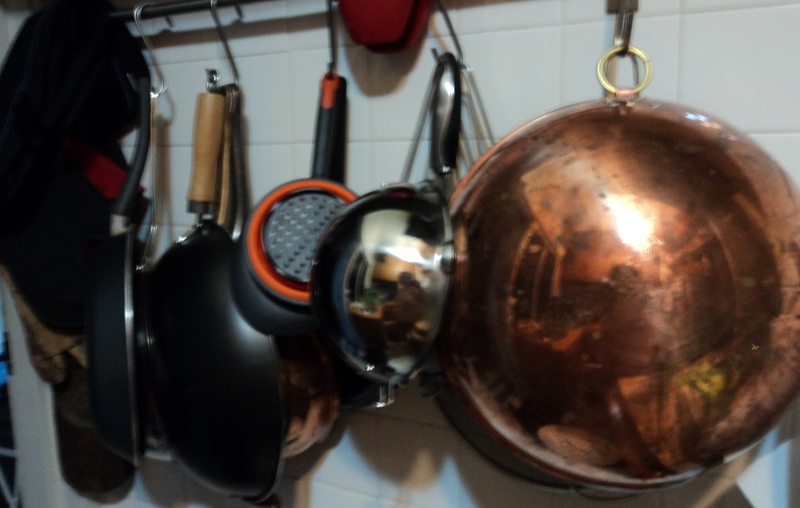 My rack of pots, pans, wok, sieves, and my brand new and much beloved (I bought a bigger suitcase just to fit it!) copper mixing bowl – the lightest most gorgeous egg whites! I cant tell you how much I love that piece. 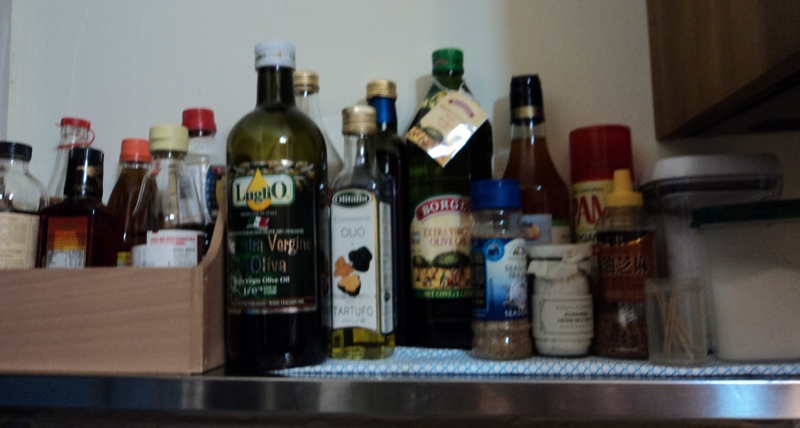 My oils and vinegars and sauces (chili, soy, tabasco, etc). All wiped down and organised. 2 rice wine vinegars, 4 toasted sesame oils, 2 olive oils! Enough is enough – so I chose the ones I used all the time and gave away the rest. And my precious Fleur de Sel and Maldon salt, which I use for cooking all the time, in airtight boxes on the right. The utensils I use when I cook over open flame. My brand new recycled cherrywood spoons (love love love), a couple of silicon spatulas, spoons, pasta spoon and ladle. Now when Im cooking, and something needs stirring, I wont be looking everywhere like a lost duck! My baking drawer. Teaspoon measures, whisks, spatulas and smoothers. Electric instant read thermometers. And my two favourite purchases from the US – my red bowl scraper which gets every last drop of batter or chocolate or whatever I am making out of a bowl, but which also acts beautifully as a smooth silicon extension of my hand… and my Oxo Good Grips dough scraper, divider, chopper, flipper. One of the coolest most useful tools ever! 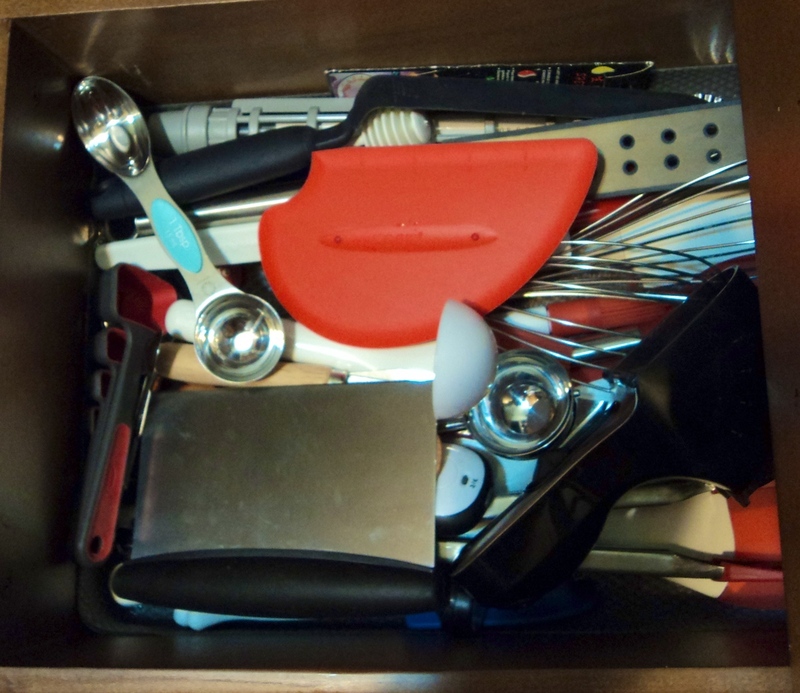 And finally, the everything else drawer! My mother’s flying saucer grilled cheese sandwich press from my childhood, my rolling pins, hard cheese grater, and some tongs, as well as my new Alessi pasta measure from the Museum of Modern Art in NY (it was so pretty, I really couldnt resist!)…. all inspected and passed muster by my beloved Kai. And now, I am going off to clean myself from my massive clean and organisation frenzy! It may not look like much to you, but for me, cooking will be even more pleasurable, clean up will be easier, and life will be happier – because everything is now settled in its own happy home 🙂 … as am I!